Nissan has extended their warranty on a few interior items in the Nissan GT-R. Originally these items were covered by a 3 year/36,000 mile warranty, but that has been extended to 6 years, and unlimited mileage. Many of the Nissan GT-R owners I know, have had lighting failures on their instrument clusters. The lights that illuminate the fuel levels, and other parts of the cluster often go bad. 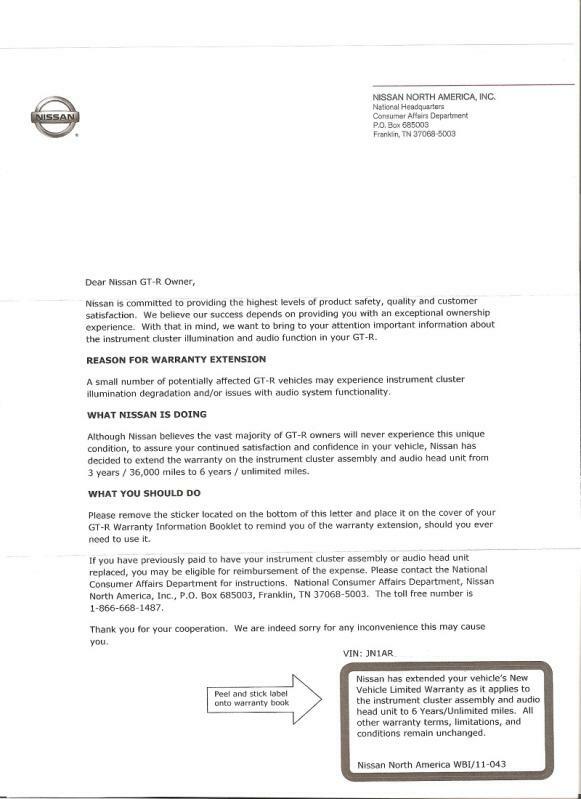 These has been replaced under warranty, but this letter shows that Nissan has identified this issue. They have also extended the warranty on the audio system out to 6 years. Although less common than the instrument cluster, I have heard of a few audio system/MFD failures.